Description: Perhaps you have heard of truffles, they are those mushrooms that grow on the roots of trees on hill and mountain areas. They are considered delicacies in our country and the sale price is about 250 dollars / pound, but it depends on the kind of truffle. But this work requires very large expenditure, gasoline, time lost in the woods, specially trained dogs, dog food and there are days when you have the chance to find nothing. But all the truffle hunters know it's the quality that first matters, specially trained dogs in this case for this type of activity being vital. 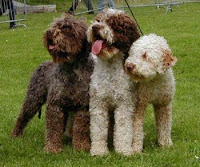 The business is proposing a mini-loft Lagotto Romagnolo breed dogs. A puppy costs between 600-1200 dollars, and an adult dog specially trained ranges from 3500 to 7000 dollars. - Mating costs (it is important that the perfect pairing with a male to do with the pedigree of the same breed), the puppies will become a value obtained as parents. - This is a small dog, weighing 20-30 pounds at maturity and has a height of up to 50 inches. Conclusion: the truffle trade is beginning to expand, but it will take a while to reach its full potential. In such a business there are great opportunities, even if you don’t sell the dogs, as specially trained dogs can make money for the owner. 0 Response to "Lagotto Romagnolo"